Azamara Club Cruises is launching a new cabaret-style of entertainment aboard their three ships with three unique types of shows. Fans of America's Test Kitchen can now sail with a version of the popular show aboard three very special sailings on Holland America Line, thanks to the ongoing partnership between the two companies. As you may remember, the city of Juneau is in a fight with the cruise lines over the proper use of money the city receives from the Alaskan head tax. It is supposed to be used for things which benefit cruise passengers. To make a long story short, the city used some of the money to build a park in an area of town the cruise lines say it would be unlikely for cruise passengers to ever go to, and the cruise lines sued the city. The city is now planning to set aside even more funds to cover the estimated $1.6 million cost of legal fees. Even if you have no interest in the scenic beauty or the science of going to a polar region, Silversea is now providing possibly another type of self-improvement reason for going to Antarctica: learning about digital photography and photo editing. This isn't just some “classroom” set up in a corner of a lounge. Silversea seems to have the professional equipment and instructors in Silver Cloud's new Photo Studio to allow the interested individual to truly learn. Of course what better place to practice than on the hundreds of photos you can take where the ship is sailing - in some of the most unique scenery in the world? 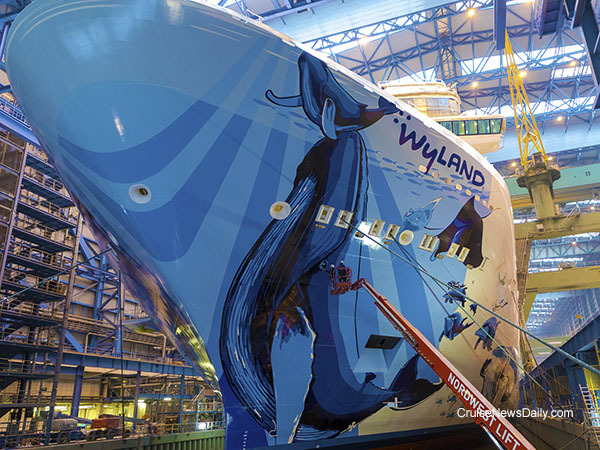 The complete story appeared in the February 7 edition of Cruise News Daily. While some lines seem to lately be struggling to get passing scores on their US Public Health Inspections, Holland America Line just keeps acing the inspections with perfect scores. This time it was Zuiderdam's turn. Details appeared in the February 7 edition of Cruise News Daily. Good-Bye, Hollywood - Hello, Sydney! Carnival Cruise Line is growing their year round Australia-based fleet by sending the 113,300-ton Carnival Splendor Down Under. The 3,900-passenger ship will represent a 66% for Carnival Cruise Line's Australia capacity. 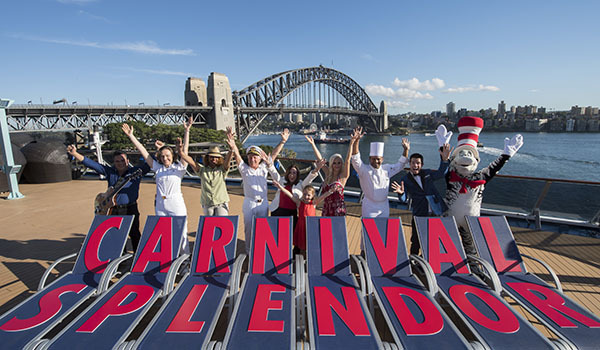 Carnival Splendor will begin sailing from Sydney in December 2019 after a repositioning cruise from Singapore (operated under the Carnival Australia flag). Anticipating the demand, bookings will open next month. Photo courtesy of Carnival Australia. All rights reserved. May not be copied or used without permission. MSC's 3-year agreement with the Miami Dolphins so fans can sail with Miami Dolphin legends and the Miami Dolphin Cheerleaders. Cunard and P&O decide to phase out all single-use plastic aboard their ships by the end of 2022. Details can be found in the February 6 edition of Cruise News Daily. Remember the old news reels where you saw a ship christened and it slid down the rails into the water? As ships grew in size, they started building them in dry docks and brought the water to the ship instead of taking the ship to the water. Now since ships are getting even bigger, they are being built in sections and then the sections are being assembled in the dry dock. Sometimes then, the sections are built on land and slide down the rails into the water. That was the case for the bow section of Sky Princess. 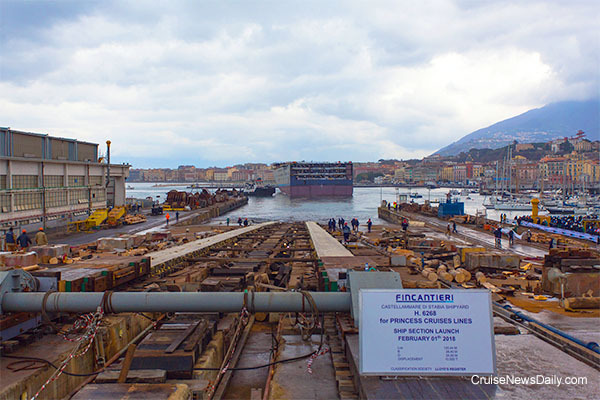 The bow was built at Fincantieri's Castellammare di Stabia yard near Naples. 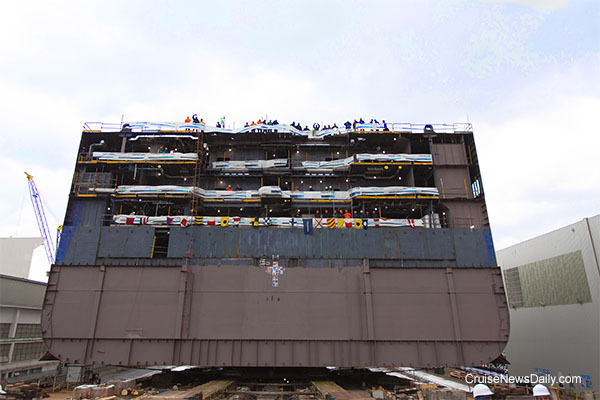 Last Thursday the 7,600-ton (weight) section was launched and rolled down the rails into the water. The complete story appeared in the February 5 edition of Cruise News Daily. A new program at Costa Crociere that seeks to reduced food waste by half fleetwide by 2020. There are reports that QE2, still docked in Dubai, is getting ready to open as a hotel.